As Chief Design Officer, Shellhammer’s creative direction and emotional storytelling will amplify Backcountry’s user experience. PARK CITY, Utah (March 25, 2014) – Backcountry.com is adding serious design muscle to its executive team. Continuing to enhance and amplify its leadership in the industry, the premier online retailer of premium outdoor gear welcomes the creative entrepreneur Bradford Shellhammer to the family as Chief Design Officer. Prior to joining Backcountry, Shellhammer founded Fab.com—one of the fastest growing online retail businesses in the world. Shellhammer will bring his unrivaled vision for design, passion for apparel and products, and sharp editorial voice to Backcoutry’s new curated Collections, user experience, and private label positioning. Admired for his design-savvy concepts, colorful outlook on life and digital retail acumen, Shellhammer will focus on Backcountry’s creative direction and brand development. Shellhammer is the driving force behind Backcountry’s new curated Collections that launch weekly. With gear handpicked by Shellhammer and key buyers, the themed Collections offer an interesting, one-of-a-kind way for customers to shop at backcountry.com. This week, Backcountry released its third Collection, "Heritage,” honoring brands that have stood the test of time. 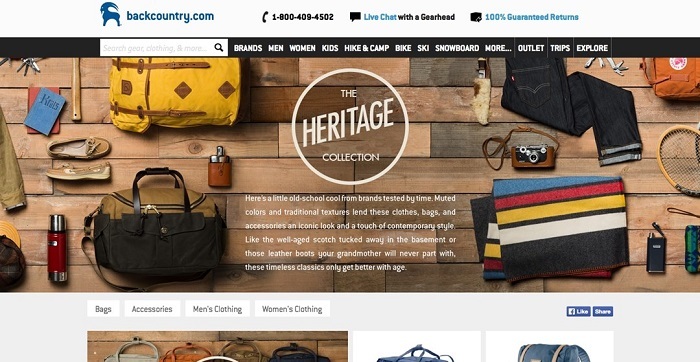 In addition to commanding Collections, Shellhammer will lead refinement of Backcountry’s design platforms, user experience and private label strategy in further solidifying the company's authenticity, differentiation and leadership in the industry. Shellhammer has been named one of the “100 Most Creative People in Business” by Fast Company, coined the “King of Quirk” by Forbes, and the “Eames of E-Commerce” by USA Today.